Town wide sales days in store and on sidewalk. Call store’s for hours www.pointchamber.com for store information. 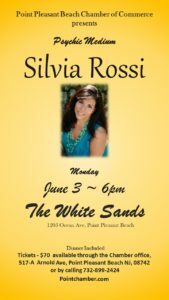 An evening with Psychic Medium Silvia Rossi includes Dinner at the White Sands Hotel & Spa. Tickets sell out early, please call us at 732-899-2424 to reserve your spot. Fast, friendly and fun!!! The Festival of the Sea 5k is celebrating its 5th year! Come out and participate or cheer on the runners as they cross the finish line on September 21, 2019. JTM Running brings you this stroller, family, kid and pet friendly fast, flat course along the beautiful beach and boardwalk of Pt. Pleasant Beach. Great prizes to the top runners. Awards will be given to the Overall top 3 males and top 3 females and 1st place males and females in these age groups: 13 and under, 14-18, 19-29, 30-39, 40-49, 50-59, 60-69 and 70+.